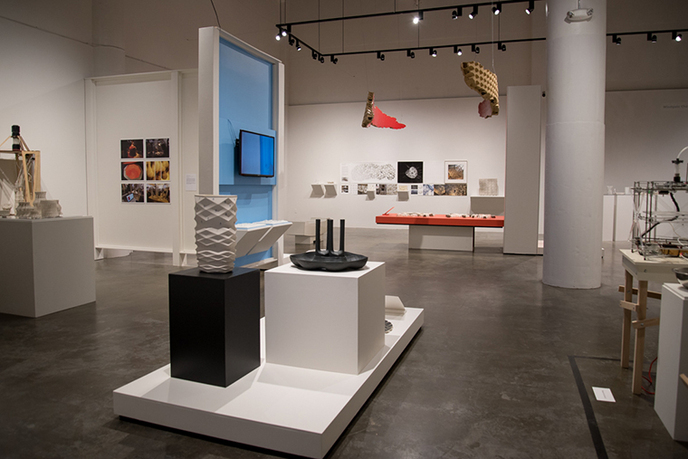 Brian Peters, Building Bytes, on view in Data Clay: Digital Strategies for Parsing the Earth, San Francisco Museum of Craft and Design, 2015, San Francisco.Photo: Samuel Abhaya. 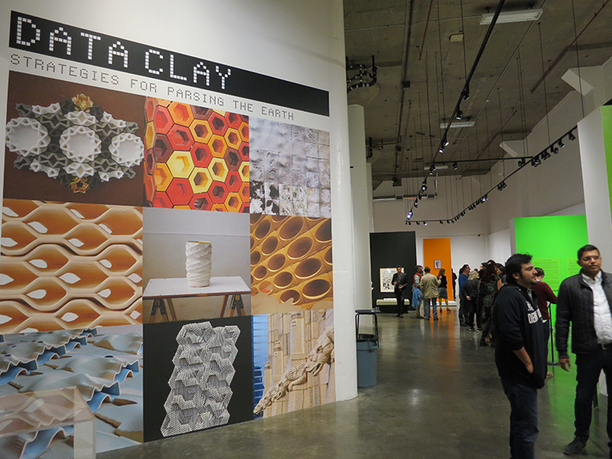 Data Clay is the first public exhibition and symposium to discuss the nascent movement of architects, artists, and designers exploring the medium of ceramics coupled with digital technologies. 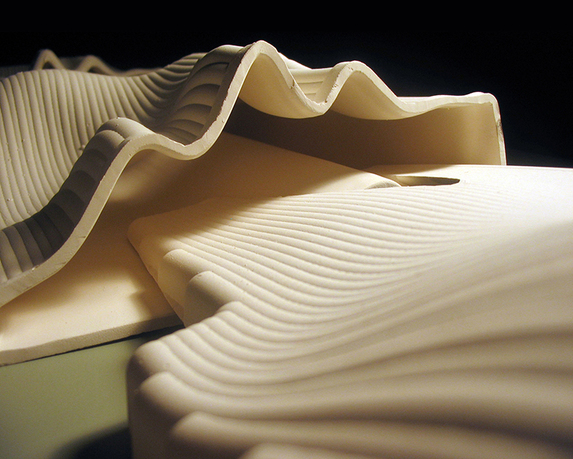 In recent years, a renewed interest in the potential transformation of basic materials into complex hybrid systems has pushed ceramics to the forefront of innovation in the allied design fields. 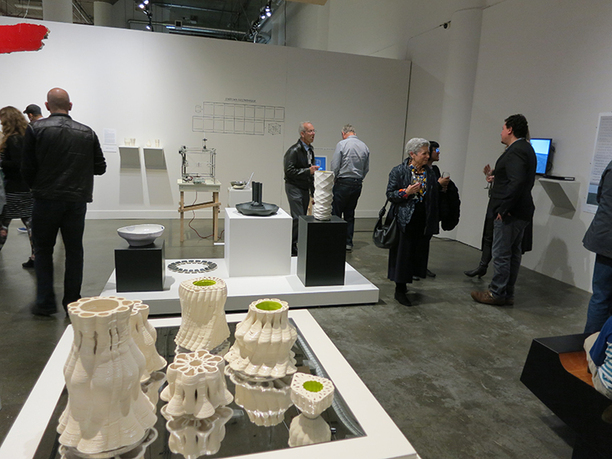 Rather than relying on the abstract data of numerically controlled production to distance themselves from the material world, the artists and designers represented in this forum employ/research well-rooted craft techniques to re-engage the world of matter, paying keen attention to material parameters and behaviors, and positioning the ceramic process as a powerful challenge to the image of slick, immaterial virtuality so often associated with the digital world. Data Clay gathers leading researchers and practitioners defining this field through a range of diverse agendas and techniques. Del Harrow is a sculptor and educator based in Fort Collins, Colorado. He is an assistant professor of art at Colorado State University and has taught previously at Pennsylvania State University and Kansas City Art Institute. He has lectured at the University of Colorado, Alfred University, and Harvard University’s Graduate School of Design, among others. 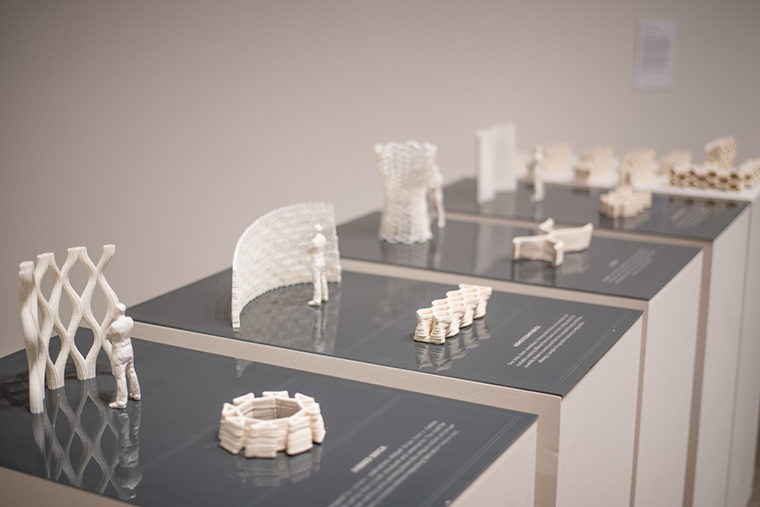 He has taught a number of workshops (most recently at Penland School, Haystack Mountain School, and Cranbrook Academy of Art) that address digital and parametric modeling in conjunction with analog fabrication and "hands-on" work with clay. 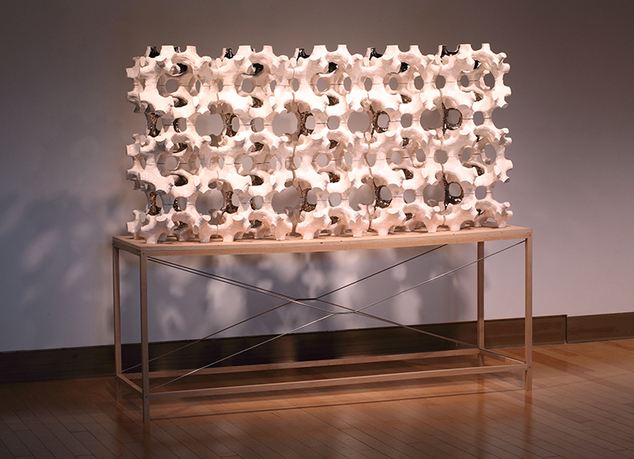 His work explores this same intersection of digital design with manual- and skill-based fabrication processes, and he has exhibited recently at the NCECA conference; Dolphin Gallery in Kansas City, Missouri; and the Denver Art Museum. 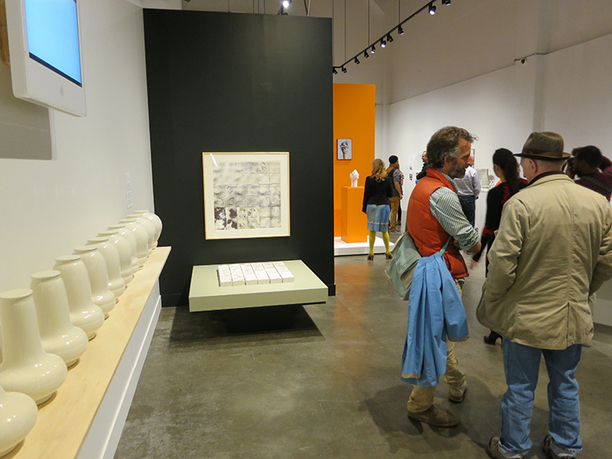 He cocurated (with Stacey Jo Scott) the exhibition New Morphologies: Studio Ceramics and Digital Processes (2013) at the Schein-Joseph International Museum of Ceramic Art at Alfred University. Joshua G. Stein heads Radical Craft, a Los Angeles-based studio that investigates urban and material patterns through a focus on the intersection of traditional craft and contemporary technology. By viewing the production of urban spaces and artifacts through the lens of archaic or traditional phenomena—from archaeology to craft—he seeks to evolve solutions for the problems posed by contemporary virtuality, velocity, and globalization. 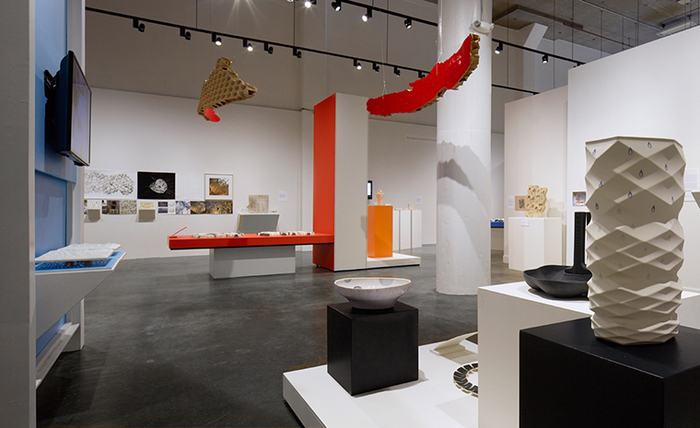 His material investigations include digital mold-making and ceramic slip-casting as explored at the European Ceramic Work Centre (.ekwc) in s'Hertogenbosch, Holland, and responsive technology exhibited (with Rob Ley) in the Reef installation at Storefront for Art and Architecture in New York. He has taught design studios and fabrication seminars at California College of the Arts, Cornell University, SCI-Arc, and the Milwaukee Institute of Art and Design. He was the 2010–11 Rome Prize Fellow in Architecture, and is currently associate professor of architecture at Woodbury University.